Looking for a forex trading strategy technique is simple or simple but consistent profit for daily trading, scalping or swing. We do not need to worry about the effects of simplifying a trading strategy against the opportunity to achieve consistent profit. Even with a forex strategy like this, we will benefit more easily. By applying simple trading techniques will further reduce the burden on our brains, the effect of reducing the setress value faced without having to wrestle with the complexity of trading analysis. Understanding and knowing the position of support and resistance is indeed important, but it's better not to over-identify. Usually traders feel afraid of mistakes when determining support or resistance because the technique tends to be subjective. So, traders draw a lot of horizontal lines and make it as the first support, second support, third support and so on. Especially if added with a lot of resistance levels. Even though only relying on one level of support or resistance level, we can already recognize enough understanding to find out price movements. The more easily a chart is read, the easier the strategy will be. Inevitably trading can cause addiction if we are not careful. Paying attention to the chart screen for hours can make us obsessed with eventually increasing trading activities. Every time there is always a feeling of wanting to trade. It's just too much doing trading activities instead of helping us know every opportunity, even saturated because of watching the chart for a long time. As a result it obscures our level of focus. When experiencing a large loss, traders will try to stay away from trading because they are hesitant to go back to options because of trauma. Well to avoid negative problems from the effects of erratic trading patterns, it is better we set a trading schedule everyday. 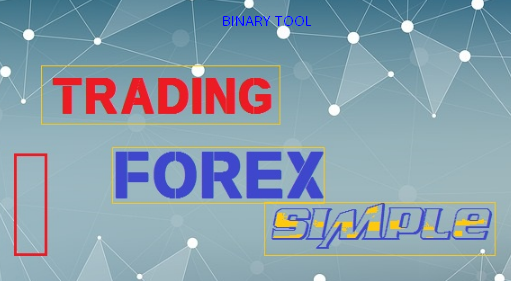 The point is in a simple forex trading strategy, it does not at all suggest for a whole day continuously monitoring the chart screen on the monitor. We recommend that you use the trading time as best you can with other daily activities. Usually traders have the desire to get the best forex strategy, and it certainly develops on every trader. In my opinion, it is natural, but in reality looking for a 'holy grail' will only make us waste time. Things like this usually inspire traders to struggle to get the most sophisticated and often complex system of strategies. The point is this simple forex trading strategy recommends that we stay away from trading methods like beginners. Usually beginner traders are trapped in the use of several indicators, because they feel the need to reduce signal errors from other indicators. In order to avoid the trap, stay away from unnecessary indicators and learn how to interpret candles. Like choosing indicators, trading methods must also be screened as best as possible. We recommend that you select and use one trading method that matches your experience and matches your trading style. Then apply a simple trading method from the trading method. For example, if we apply the daily trading method, then use a simple daily trading method. If it is suitable with news trading, then use a simple news strategy too. Simplify trading strategies including one of the tips, tips and how to succeed in trading. Actually there is nothing forbidding a trader to look for the best techniques and strategies. But keep in mind that those senior traders who are full of adventure try various kinds of systems In general, they will end up frustrated with their own strategies. In the end they will clear the trading chart and finally return to the ground to apply a simple forex strategy. For those of you who have never experienced anything like that, wouldn't it be better if you applied a simple forex strategy from the start in order to be successful in trading.